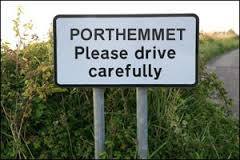 In the last few weeks over to Porthemmet they’ve been getting some excited by Poldark fever. Down the Cornish Arms, the only topic is how to say Poldark. Should the emphasis be placed on the first bit – ‘POLdark? Or perhaps we should stress the second – Pol’DARK. As the argument rages to and fro over pints of Tribute, it seems virtually everyone who mentions this series at the BBC, and there do seem to be a hell of a lot of them, pronounce it as ‘POLdark. Not a surprise, as this is in line with the normal pronunciation of two-syllable English placenames. Think Newquay, Norwich, Preston or even Plymouth, although perhaps that’s going too far. And Poldark looks very much like one of those surnames that come from placenames. But Cornish two-syllable placenames like Penzance, Redruth, Liskeard are pronounced in Cornwall with the stress on the second element. Or should be. The reason the stress is there is because the first element (Pen, Red, Lis) is the noun and the second the adjective. which is back to front when compared with English placenames – Newquay, Stratton, Falmouth and the like. Two-syllable Cornish surnames based on places are pronounced in the same way, with the emphasis on the second syllable. For example Cardew, Polmear, Penrose, Treloar. So a Cornish man or maid might automatically pronounce Poldark as Pol’DARK, like those other names. But do they? In fact, most people either follow the clever folk up London and give Poldark the English style. Or they hedge their bets and don’t stress either element, ending up treating each syllable democratically – as in the placename London. Scything in the 18th century. Sighing in the 21st. Who’s right? Perhaps nobody, because as we know there’s no such place as Poldark. It’s a name Winston Graham made up in the 1940s. However, had there been a real Ross Poldark riding his ‘oss endlessly up and down the cliffs, taking care to ensure the sun was always setting over the sea behind him, you can be sure his name would have been pronounced Pol’DARK. Loveday Tresoddit down the Cornish Arms says it’s all a Baudrillardian simulacrum, a referent with no referents that nevertheless is more real than the real. The rest of us don’t know what the bleddy ‘ell the maid’s on about. Mind you, there’s a braave bit of interest in the book Ceecil Pearce has made on how many times the Beeb will gratuitously steer that Aidan Turner into taking his kit off. Kit or no kit, hyperreality or fictional escapism, at Porthemmet we’re all looking forward to a televisual feast. Though some do reckon we’re in for some tasty insights into our heritage, others are fearing we’ll all be sick as rats after a few episodes. This entry was posted in Cornish language and culture, Poldark papers, TV and Cornwall by bwdeacon. Bookmark the permalink. Another Baudrillardian simulacrum is Poldark tourism. Yes, the emphasis should be Mara’ZIon. This follows the normal rule in Cornish names that in multi-syllable names emphasis is placed on the penultimate syllable. This is an interesting placename, as the settlement originally – before around 1600 – comprised two different places. One was Marhasvean (Cornish for little market). This evolved into Marhasion and then Marazion. The latter was influenced by the other place, called Marhasyow (or Thursday market), which in later centuries became anglicised to Market Jew. Bernard, how would Gran Cross pronounce it? Interesting question. Don’t want to be asking her yet though! How would you pronounce Redruth…..an English colleague of mine insists it’s RED-Ruth…said as two separate words almost!! He claims it must be how it’s said because the BBC say it that way! I pronounce it more R’druth! Which is correct? You’re right, not your colleague. Sometimes you can even hear Redruth pronounced as ‘Druth. The pronounciation exactly reflects the Cornish meaning (Red = ford, ruth =red), with the emphasis on the adjective.